The Rhododendron is the state flower of Washington. Hundreds of varieties thrive in our climate and their prolific blooms are a big part of the reason why spring is such a spectacular season in this region. Still, I've had lots of clients who don't like them. Mostly, their experience of rhodies is that they get huge, turn into big green uninteresting blobs, and block views from windows. But that doesn't have to be the case. Here's a list of compact Rhododendrons that won't outgrow their welcome. 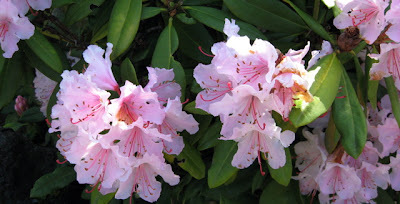 For more information on rhododendrons, I recommend Greer's Guidebook to Available Rhododendrons, by Harold Greer. I've used my copy so much, it is literally falling apart. It's held together now with scotch tape. This book is considered by many to be "the bible" on rhododendrons with descriptions and ratings of hundreds of cultivars. He includes color photos of many flowers, as well.